The FR60MBH mailbox is suitable for horizontally storing A4 mail for front entry and retrieval. This mailbox has been developed to restrict the spread of fire for up to one hour only and if recessed into a fire rated wall, will maintain the integrity of the fire rated wall for up to one hour. Internal use only. Fire Rated mailboxes include a number of specifically developed features to meet Fire Rating standards BS 476-22:1987 Clause 8 which outlines fire testing on building structures. 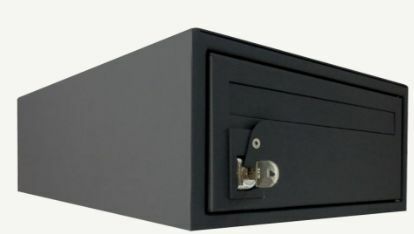 The lock included in fire rated products uses a fire cover to limit the access for fire to the mailbox lock. The mailbox flap uses an inward sprung hinge to stop the flap from falling out of the box and the mailbox aperture uses an intumescent seal which expands when exposed to a large increase in temperature, closing the gap and restricting the flow of oxygen into the mailbox. This mailbox will also comply to Secured By Design requirements where applicable (contact DAD UK Ltd for more details). 300 x 140 x 360 mm. Two numbered keys per box. Lock with 500 variations. Any RAL powder coated enamel, colour - 15 RAL colours to choose from as standard; consult manufacturer for other options and insert requirements. Insert requirements or drawing reference.